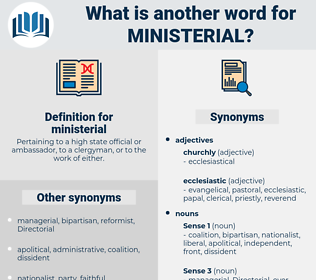 What is another word for ministerial? Pertaining to a high state official or ambassador, to a clergyman, or to the work of either. organisms, documents, Organizations, Duties, priorities, groups, Bodies, functions, units, corporate. requirements, stakeholders, counsellors, reasons, Guidelines, plans, outcomes, orders. departmental, minister, ministers, cabinet, corporate. 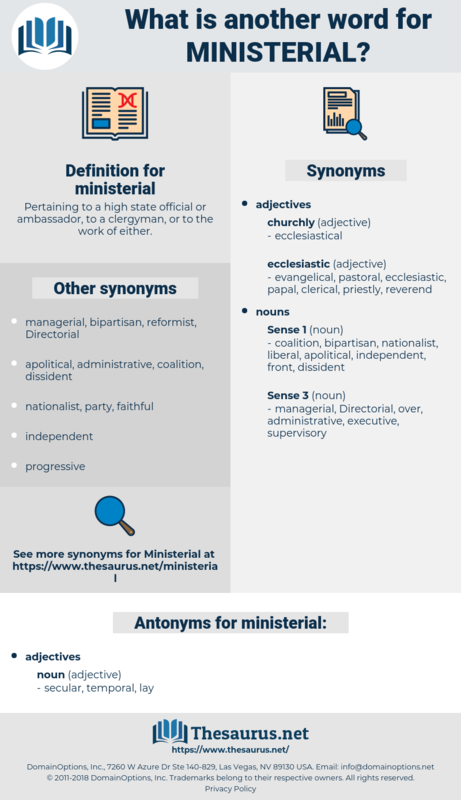 The cabinet exists as an informal, extra - legal ministerial group into whose hands, through prolonged historical development, has fallen the supreme direction of both the executive and the legislative activities of the state. Lord John Russell flung the Report into the ministerial waste paper basket, and despatched a young Englishman named Nicholls, a member of the English Poor Law Commission, to report afresh on the subject. megesterol, magisterial, magisterially, masterly, muster roll, menstrual, mistrial, minstrel, mistral.